Today, June thirtieth in the year 2017, marks the end of the half-year for 2017. Therefore, I call it The Half Year Eve. Tomorrow, will be July first in the year 2017, and, I see it as an opportunity to assess what I hope to accomplish in this calendar year. However, at this moment, my duties are dedicated to helping an injured pigeon that I discovered in my rooftop garden last night. At the time, I wasn't able to assess his injuries, as it was too dark. Additionally, he kept trying to hide behind my large planters. 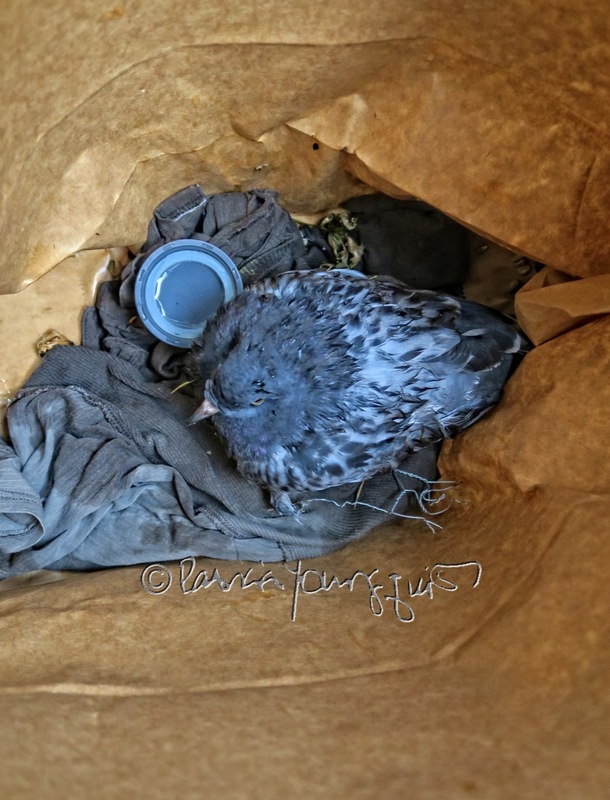 Therefore, I was unable to lure him into a container in order to transport him to The Wild Bird Fund (WBF) because it was too dark. Moreover, at that hour of the night, The WBF is not open. However, I was able to reach Tina Pina (AKA Mother Pigeon), by phone, and she advised me as to what to do if I saw the creature this morning. When I went into my garden this morning, I was relieved to spot him, and to know that he had made it through the night. But I could tell the pigeon was not feeling well, and I literally gave him the shirt off my back; for I took the shirt I was wearing as a jacket off, and wrapped it around him so that I could pick him up, and put him in an over-sized brownbag (as seen in the photographs atop this entry), in order to be able to take him to The WBF when they open today. 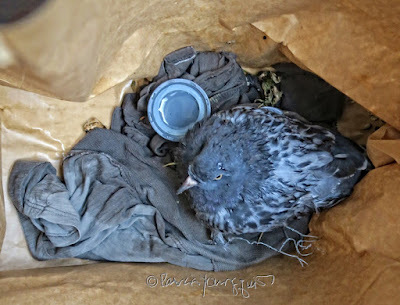 Upon placing him in the bag, and adding a container of water and some food, I discovered that he had gotten his foot or wing caught in some wire contraption. I don't know how he managed that, as I have nothing like that around, but there he was caught in a wire. I attempted to free him from this, but I stopped as I was afraid I might cause more damage to this sweet pigeon, who had gotten himself into quite a fix! Hopefully, I'll be able to get him to The WBF, and, hopefully they will be able to free him from the wire contraption, as well as treat any injuries which might have resulted. He is vacillates between being subdued and feisty, as I write this blog posting. But, I'm confident that if he survives the situation, his half year resolution will be to stay away from wire contraptions. Soon It Will Be Father's Day 2017!